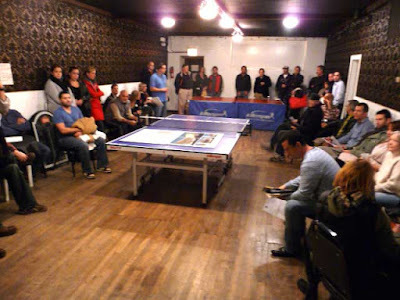 East Village Association | West Town Chicago: Pizza Hut choice: Cars or pedestrians? Pizza Hut choice: Cars or pedestrians? Meeting commenced 7:05 p.m. Mary Clemmons with Bend Yoga did a brief presentation of her business. Bend Yoga is located at 906 N. Damen Ave. and was started last September. It is a drop-in studio and offers classes everyday of the week. Dan Nehm was a guest speaker on window repair and energy efficiency. Nehm supported old-growth wood and repairing old windows versus replacing them with new ones. He argued that old windows can be fixed for a reasonable cost and can be as energy efficient as new windows if storm windows or weather stripping is installed. The December Holiday party is approaching and the board will discuss time and location at next board meeting. Pete Shapiro with Chicago Bowl presented his proposal for a bowling alley, restaurant and music venue at 1850 W. Chicago. Shapiro and his group are in need of a PPA license to operate a bowling alley. Scott Rappe and Neal McKnight with the Planning, Preservation and Development committee made and seconded a motion to not oppose a PPA license for this proposal. Members voted and no one was opposed to the motion. Dana Palmer passed out signs that residents can place on trees or fences alerting pet owners to clean up after their pets. Scott Rappe's presentation regarded why the board turned down a proposal for the old Pizza Hut location. The building would have catered primarily to use of the car and would have required reversing Division Street's pedestrian designation. The board and other members would prefer to see a more pedestrian friendly proposal.